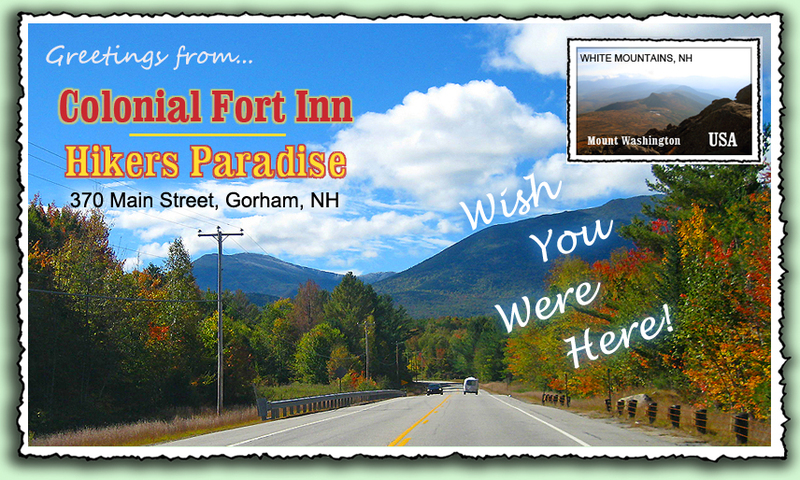 Located at the heart of the White Mountains of New Hampshire and the doorstep of the Great North Woods, enjoy our small family owned and operated motel in the town of Gorham. The Colonial Fort Inn has rooms with one, two or three beds all with baths. Breakfast is available. All rooms have fridges, cable tv, Wi-Fi and ac/heat. There is ample parking. Whatever your outdoor interests are, we can accommodate your indoor needs all year ‘round. Gorham has many dining options, shops and a moose tour to view our most popular wildlife. Near-by are hiking trails on Mount Washington and the surrounding White Mountains, the Auto Road up our highest peak and the Appalachian Trail. There is a new ATV trail from which you can ride from our parking lot either to town or to the trail. Also in the vicinity are Story Land, Santa’s Village and Fort Jefferson Fun Park. All around us are views of spectacular fall foliage; we can show you off the beaten path roads for lovely views. Winter fun includes alpine skiing at Wildcat and 5 other ski areas within a 45 minute drive, cross-country skiing at the base of Mount Washington, winter hiking, ice-climbing and snowmobiling on Corridor 19. Because of our unique location, Colonial Fort Inn is at the center of what the four seasons can offer to everyone in the North Country of New Hampshire; mountains, woods, lakes and tourist attractions.